Getting organized has never been easier. These decorative grey metal wire baskets are spacious storage containers that allow you to keep your possessions at your fingertips and your home tidy. Use them to handle an overflow of papers in the office, mail in the entrance or to hold fresh fruit on the kitchen counter. They can also hold coffee pods at home or at the office. IDEAL STORAGE SOLUTION FOR EVERY ROOM IN THE HOUSE - Getting organized has never been easier. 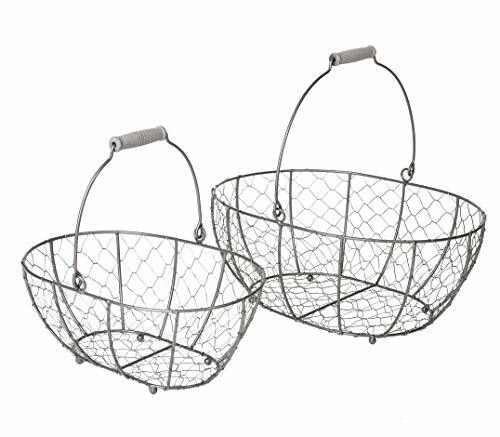 These decorative grey metal wire baskets are spacious storage containers that allow you to keep your possessions at your fingertips and your home tidy. Use them to handle an overflow of papers in the office, mail in the entrance or to hold fresh fruit on the kitchen counter. They can also hold coffee pods at home or at the office. OPENWORK WIRE BASKETS ARE STYLISH AS WELL AS PRACTICAL - Decorative black wire baskets add a stylish touch to your home. The open design adds a rustic farmhouse feel to any space-a look that is right on trend. Display your favorite books on an office shelf, or use them to hold your mail on a console in the entrance. IDEAL TO OFFER AS GIFTS - In addition to being a fabulous gift idea on their own, these lovely metal baskets make wonderful gift packages holding baby items for a shower or tea towels and a candle for a housewarming gift. WOODEN HANDLES OFFER EASY PORTABILITY - These sturdy baskets feature smooth wooden handles. They're lightweight and can be easily carried. You can store bath toys or picnic essentials in them and carry them from one place to another. They're ideal for holding cut flowers from the garden or carrying a handful of items from the kitchen to the patio.